I do also think that the Khufu car-touche was a hoax and leave it at that. However i am also aware that a whole global sea borne Bronze Age emerged more or less at the time of Khufu or shortly thereafter. This did have the knowledge and skills needed to actually build such a structure. As well, the alignments of this whole complex is post Flood. That makes the age pretty doable along with many other similar complexes around the globe. What is not understood is that another similar distribution also exists that aligns with the antediluvian world and certainly was likely built 35,000 to 45,000 years ago. This requires two conjectures. 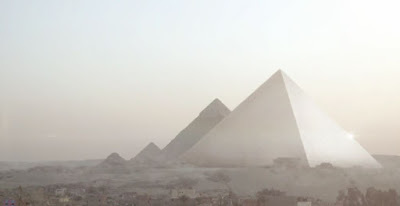 The first is that these particular pyramids were designed to tap the natural earth resonance in the earth's crust. The second is that this energy was tapped to boost the atmospheric resonance to a high enough level that it supported human mind to mind communication. This provides a unique explanation for the building of these pyramids. What if the Great Pyramid of Giza predates the Egyptian civilization? And what if Khufu was not the one who commissioned it? On the West bank of the River Nile stands one of the most impressive and oldest wonders of the ancient world, the Great Pyramid of Giza. Believed to have been built as a tomb to house the remains of Pharaoh Khufu, modern archeologists maintain the structure was built around 2500BC. However, numerous authors argue that the dating of the Pyramid—and its true purpose—are completely wrong. The Great Pyramid of Giza is one of the most marvelous and incredible monuments on the surface of the planet. Curiously, it is also the most sophisticated one, when it comes to design, engineering, and mathematics. The Great Pyramid of Giza is a massive structure composed of approximately 2,300,000 stone blocks that weigh from 2 to 30 tons each and there are even some blocks that weigh over 50 tons. It’s huge. In fact, the ancient builders used so much stone to build the Great Pyramid of Giza that you could build a wall around the planet by using stone from the pyramid. But many other enigmas surround what is considered the most magnificent structure ever built. The great Pyramid’s outer mantle was built of 144,000 casing stones, all of them highly polished and flat to an accuracy of 1/100th of an inch, about 100 inches thick and weighing approx. 15 tons each. It is sad that the casing stones that once covered the Great Pyramid of Giza were so bright that they reflected the sun’s light making the Pyramid shine like a jewel. And while there are really fascinating details about the Great Pyramid of Giza which you can read about here, this time we focus more on what’s INSIDE the structure rather than what’s on the outside. So, how do we know that the Pyramid was built around 2,500 BC, and that it was built, by Pharaoh Khufu? Well, it turns out that the dating of the pyramid and its association with are based solely on the evidence found in 1837 by British explorer Richard Howard Vyse. Not the most subtle Egyptologist and researcher, Howard Vyse and John Shae Perring worked with gunpowder forcing their way into several monuments, including the burial chamber of the pyramid of Menkaure. The only evidence inside the Pyramid linking Khufu to the structure was uncovered by Vyse. But there are a lot of things to take into consideration there. Since stone cannot be carbon-dated, and no other inscriptions, except for the Pharaoh’s official monogram, were found inside the pyramid or anywhere else for that matter, the date has stood unchallenged for centuries. But, if Khufu was in fact the builder of the Pyramid—the most magnificent ancient structure on Earth—wouldn’t He have made sure that his name was forever associated with the Pyramid, by inscribing it on various places? But not all is as it seems apparently. Not long ago new evidence surfaced that suggests that the discovery made by Colonel Vyse was in fact one of the greatest hoaxes in history, leading many authors to question everything related to Khufu and the Pyramid. There are authors and researchers who have dared to go against mainstream history and suggest that Vyse may have forged the name of Khufu himself. As it turns out, in 2014, two University of Dresden archaeology students apparently someone managed smuggled a sample of the paint used in the King Khufu markings and brought it back to Europe in order to analyze it in a laboratory. The results revealed a shocking truth. While the sample the two “archaeologists” brought back was too small for radiocarbon dating, technicians manage to determine that the pigment was not painted onto the original limestone blocks when the pyramid was built, but it was placed there on a later plaster repair. What does this mean? Well simply put, it suggests that the cartouche was not original to the pyramid construction, but that it was in fact added at a much later date, giving rise to a conspiracy that Vyse fabricated the entire ‘discovery’. But why on Earth would someone like Vyse—who obviously had a passion for the history of Ancient Egypt—do something like that? Money talks now, and apparently it did the same hundreds of years ago. During his expedition to Egypt, Colonel Vyse spent a FORTUNE, nearly $1.3 million on to uncover the truth behind the Great Pyramid of Giza. Many experts have suggested that Vyse may have kickstarted an early conspiracy and in his desperation to find something no one had found before, he decided to forge the cartouche of Khufu onto the chamber wall, thereby establishing an inaccurate date for the structure—which today is widely accepted by historians and Egyptologists such as Selim Hassan, Zahi Hawass, Jaromir Malek, Professor Rosalie David or Bill Manley, or major museums such as the British Museum and the Egyptian Museum, all of whom accept that Khufu was the builder of the pyramid and by implication that Vyse’s cartouche is authentic. Furthermore, Zecharia Sitchin accuses Vyse in his book The Stairway to Heaven of perpetrating the forgery because of Vyse’s “determination to obtain a major find as time and money were running out”. 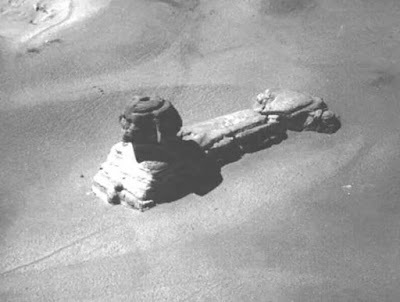 This is a rare image of the Sphinx taken from a hot air balloon, in the early 19th century. This is before excavation and restoration. So, if Khufu did not build the Pyramid, what about the Sphinx, when was the Sphinx carved and who commissioned it? To understand more about te Sphinx we must look at the Inventory Stela, unearthed by archaeologists in 1858 which details several things but most importantly, it presents a list of 22 divine statues owned by a Temple of Isis, and goes on to claim that the temple existed since before the time of Khufu (c. 2580 BC). The credibility of the Inventory Stela is viewed by Historians and Egyptologists with great caution. So if the Sphinx existed since before the time of Khufu… who commissioned it then? According to an Arabian writer by the name of Ibrahim al-Maqrizi, the Great Pyramid was not constructed by Khufu, the Great Pyramid was constructed long before the Great Flood by a king with the name of Surid Ibn Salhouk, Surid for short, but we will get to that in a minute. Interestingly, fourth-century Roman historian Ammianus Marcellinus wrote that Inscriptions which the ancient asserted were engraved on the walls of certain underground galleries, constructed in the interior of certain pyramids, were intended to preserve ancient wisdom from being lost in the flood. Getting back to the Pyramid, Arab scholars ascribed the Egyptian Pyramids and temples to an ANTEDILUVIAN AGE, writes Alan F. Alford in his book: Pyramid of Secrets— The Architecture of the Great Pyramid Reconsidered in the Light of Creational Mythology. Furthermore, the author notes that One popular tradition, drawing on Coptic and Hermetic lore, asserted that the builder of the Pyramids and Temples had been “the first Hermes” or “Hermes of Hermes”, otherwise known as Hermes Trismegistus on account of his threefold qualities od prophet, kind, and a wise man. A second popular tradition, drawing on old Arab lore, maintained that the builder of the Pyramids was an antediluvian king by the name of Surid Ibn Salhouk. In the 13th century writes Alfard, it was suggested by one writer that the Pyramids had been built by a pre-Adamite race—inhabtants of an earlier Earth. These ideas eventually became merged to the extent hat “Surid” was identified as Hermes. Arab writers named King Surid as the one who, having learned of the coming flood in a dream, erected the Pyramids as vaults to protect antediluvian books and artifacts. Among the reporters of this particular legend are the astrologer Abumasar Balkhi, historian Abd al-Hokm, al-Masudi, and Ibrahim al-Maqrizi as mentioned earlier, all suggesting that Surid was Hermes or Enoch. Hermes Trismegistus was either a contemporary of Moses, or the third in a line of men named Hermes, i.e. Enoch, Noah, and the Egyptian priest-king who is known to us as Hermes Trismegistus on account of being the greatest priest, philosopher, and king. Staniland Wake writes in the Origin and Significance of the Great Pyramid that Masoudi who died in the year 967 A.D., professes to relate the Coptic tradition, which says, “that Surid Ben Shaluk Ben Sermuni Ben Termidun Ben Tedresan Ben Sal, one of the kings of Egypt before the Flood, built the two great pyramids; and notwithstanding they were subsequently named after a person called Shed-dad Ben Ad, that they were not built by the Adites, who could not conquer Egypt, on account of the powers which the Egyptians possessed by means of enchantment; that the reason for building the Pyramids was the following dream, which happened to Surid three hundred years previous to the Flood. Masoudi describes the guardians assigned by the king to each pyramid. As noted by Wake, Surid may be the same as Suphis or Cheops, as in a papyrus said to have been found in the monastery of Abou-Hormeis, Surid is said to have been buried in the Eastern (Great) Pyramid, his brother Haukith in the western, and his nephew Karwars in the smaller pyramid. (Vyse, “Operations,” etc., vol. ii. p. 332. )—Surid appears to be given in the list of Manetho, under the name of Sôris, as the first king of the fourth dynasty. This king is, however, treated by M. Lenormant as non-historical. (Sec List of the Kings of Egypt, “Histoire Ancienne de l’Orient,” tom. ii. p. 430), and he refers to Khoufou (Suphis) the tablet at the mouth of the ancient mine at Sinai, which English Egyptologists ascribe to Soris (Shuré). The name of this king is also said to have been found in the tombs near Ghizeh, and in the quarry marks of the northern pyramid of Abou-Seir, which is, therefore, thought to be his tomb. (Sir J. G. ‘Wilkinson, in Rawlinson’s “Herodotus,” vol. ii. p. 344, 346).